To produce captivating videos rooted in culture and art. Grand Marquee Productions loves to travel. We venture around the globe to culturally diverse places to make video projects that you enjoy watching again and again. We strive to bring content rich videos into the world that present messages in short bursts of time. Our videos have a high impact on viewers, and leave long-lasting impressions although they are usually only several minutes long. We consider them a hybrid morphing of documentaries and music videos, or "Docu-musicals". Beginning in 1999, we were early adopters of digital video, and worked in the burgeoning area of what some called "Punk Cinema". Then, we cut everything on powerbooks. Our first project was a jury selection in a Hollywood film festival for shorts. Over the next few years, we produced cultural videos to document the times, and share local ideas globally. Videos were shot of diverse places such as Croatia, Japan, and the USA. In Feb of 2004, we won a prize at an environmental video contest in Maui, Hawaii. In 2005 the judges at the 26th Annual Telly Awards awarded us 3 Bronze Telly Awards® each in different categories. In 2006, we earned a GMP record of 7 Telly Awards®, including 2 Silver Tellys®, the highest accolade. In this batch of awards were two for internet motion graphics - - the first time we recieved recognition for our Web work. Each of our submissions were granted multiple awards in a variety of categories. In 2007 GMP started winning recognition for digital photography with 6 different images selected for "Editor"s Pick" awards in prestigious world-wide photo contests. 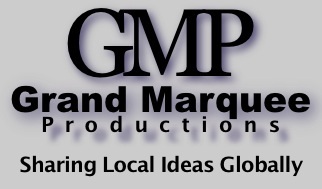 Roughly 80 other GMP photos appeared in online books. In 2008 a GMP photo was selected out of 31,600 entrants as a winner in one of the world's biggest photo contests. The photo won a gold medal for Second Place in the Elements of Design category. In 2009, GMP photos continues to win awards. We're also preparing for the launch of the show "Sake Road". Click on the above Telly Award to see award winning video. Click on Gold Medal to view prize winning photo.